“As the soil, however rich it maybe, cannot be productive without cultivation, so the mind without culture can never produce good fruit.” Seneca (Roman Philosopher, mid-1st century AD). Wise words, echoed, in Patrick Whitefield’s explanation of the word “permaculture”: “Although permaculture started out a permanent agriculture, the principles on which is is based can be applied to anything we do, and now it is thought of as permanent culture.” Permaculture in a Nutshell, p 3. So, leaving agriculture behind us for an hour or so, out of our working clothes and in our Sunday best, we took a trip up to the local bar / bakery (boulangerie) to dispense a bit of culture. Gabrielle with her violin and our friend Alastair and his guitar were invited by Jacky and Danielle to play in their bar. 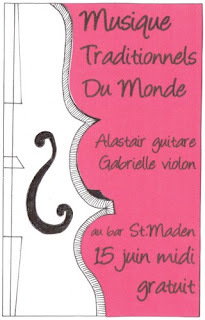 It was a great success (see video at top) and served as a good preparation for Gabrielle and Alastair, who are playing in Medreac this coming Saturday, participating in the countrywide Fête de la Musique. sounds good to me! there is nothing quite like the public in a breton bar...but at least no one smokes anymore. I used to have people standing 3 cms away from me blowing smoke down my lungs as I sang! Who is that handsome ( note perfect, always good humoured ) guitarist? Caroline has footage from yesterday of the same song, perhaps we can pool our resources and come up with a complete Mtv friendly video. ( multiple exotic locations,multi camera shoots...)ending the evening jamming with Mr. Quality Street, and his beautifully recycled tin banjo.